What is CDB Cream Pain Relief Rub? 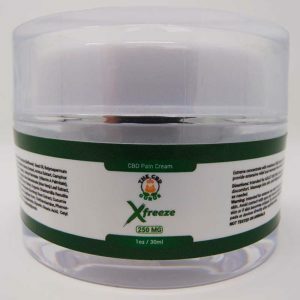 This CBD Cream Pain Relief Rub is a revolutionary medicating product that when applied to the affected area, eases the pain from neck and back pain, joint inflammation/pain, arthritis, muscle soreness/tenderness. Pain Freeze is comprised of all natural and naturally sourced ingredients to aide in the body’s own healing process while providing relief from pain. If you are looking for more of a fast-acting rub for pain relief, try our deep penetrating Pain Rub. This CBD Cream Pain Relief Rub is a combination of contentious manufacturing and 99% certified pure CBD. The other naturally sourced ingredients are: Camphor oil, Aloe Vera Extract, Arnica Montana Extract, Carbomer, menthol USP Natural 4%, FD&C Blue 1FC & Yellow 10, ILex Paraguanensis Leaf Extractlsopropyl Alcohol, Tocopheryl Acetate (Vitamin E), Methylparaben, Trietha, and Tea Trea Oil. Apply CBD Pain Freeze to the affected area such as lower back, neck, knee, hip or shoulder. Massage the cream into the area allowing it to penetrate. Use on the affected area no more than four times per day. CBD Cream Pain Relief Rub – What are the Benefits? CBD Guru’s Pain Relief Rub harnesses the natural healing properties of CBD and combines it with other natural healing components to provide target specific pain relief. It can be used to ease and relive pain and inflammation of the neck, back, shoulder, knee and all forms of arthritis. You just topically apply Pain Freeze to the affected area and the benefits will be yours. Reduced pain and swelling along with better mobility.